Hello, hello! Godwilling, as you are reading this, I will be on my way home from celebrating my brother's college graduation in Indiana. I can't wait to see what you have been up to this week. I have three features this week; a main dish and two desserts (I just couldn't choose). We had over TWENTY FIVE link ups last week and I can't wait to have even more this week. 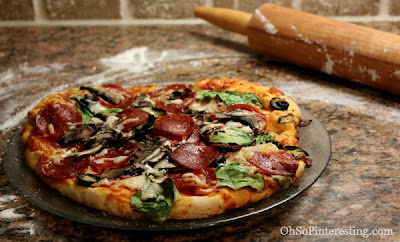 My first feature is this pizza on grill from Cynthia at Oh So Pinteresting. We love pizza on the grill and now that the summer months are upon us this post is a reminder to me about how much I love it and need to make it more often. My next pick has an ingredient that I did not know existed before last week, biscoff/cookie butter. I am still unclear on exactly what it is but I do know that it looks amazing. 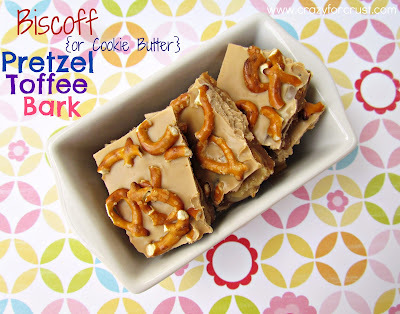 This Biscoff Pretzel Toffee from Crazy for Crust has me completely intrigued and since I love anything having to do with saltine cracker toffee, I will be attempting something like this as soon as I can find cookie butter. 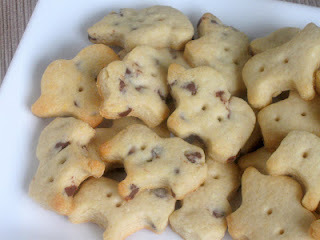 Last but certainly not least, are this adorably delicious looking Homemade Animal Crackers from Searching for Dessert . I just love how traditional they look and the addition of mini chocolate chips is genius! I wanted to make them the minute I saw them but I exercised some restraint and added them to my never ending Pinterest board of things I want to make for dessert. Thanks for the linky party. Loved your post on spaghetti squash pesto...you are the spotlight on this week's blog hop on my site: Ducks n a Row! Be sure to stop by. Hi Kaylee, I found Mealtime Monday through your Swiss Cheese Dip post that was linky-ied to 33 Shades of Green's Tasty Tuesday. How is that for a round about route??? Anyway, love your site and I joined the party with my Enchilada Lasagna Casserole.